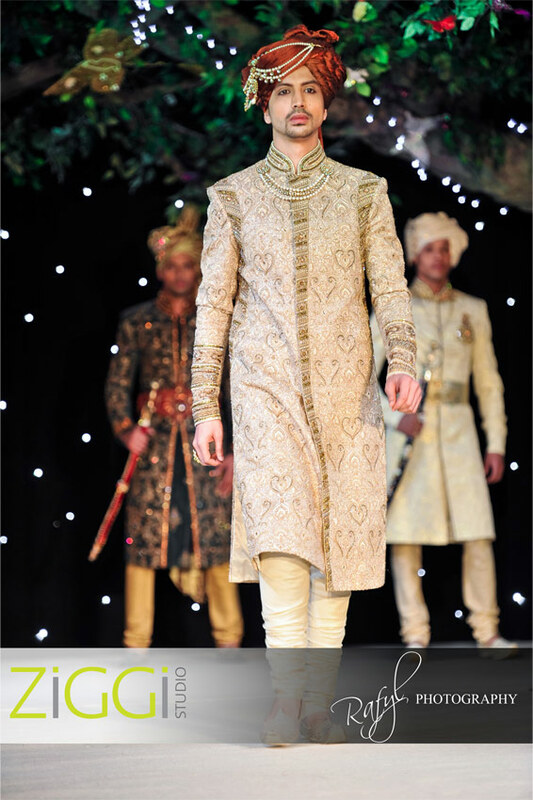 Here's the very regal Raj Gharana sherwani collection from Ziggi Studio which was debuted at the 2011 Asiana Bridal Show in London. 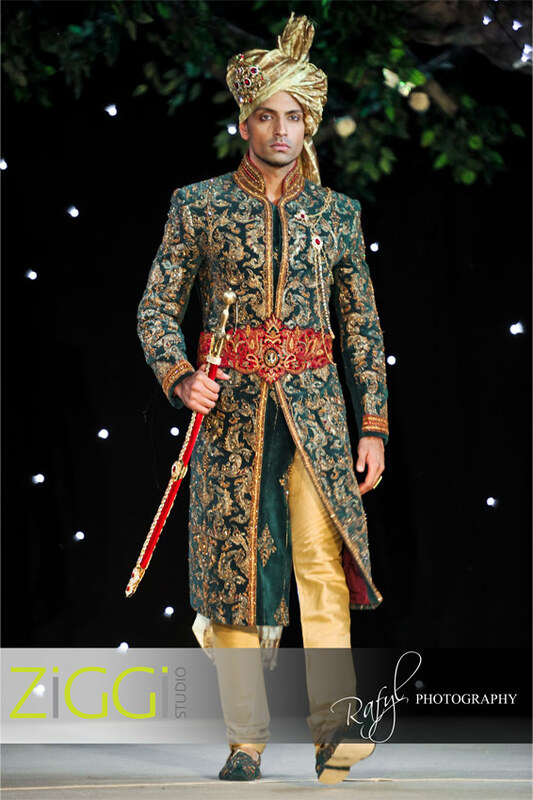 I got the chance to speak to Ziggi and get all the details about each piece, starting with this very striking green and gold velet sherwani. 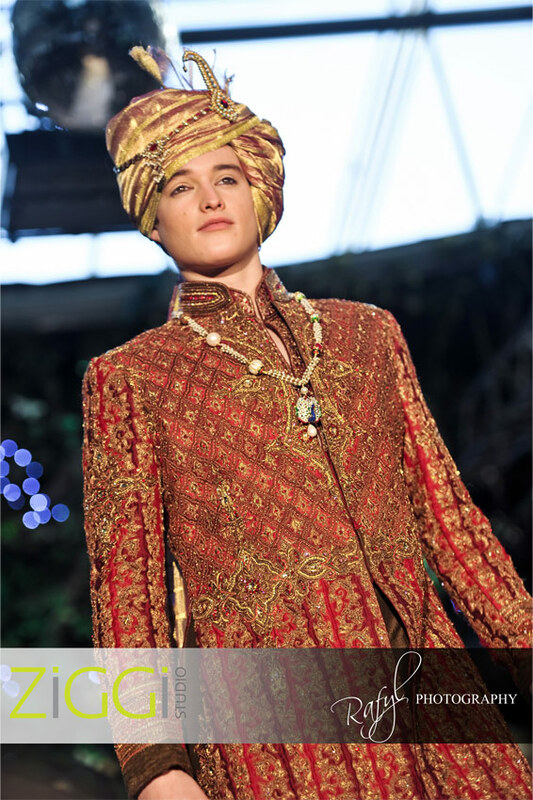 This was the showpiece of Ziggi Studio's catwalk and really set the scene for this very regal Mughal India inspired collection. Next up was this lighter coloured sherwani with pearl work. The first two sherwanis in this collection feature waistbands over the top or cummerbunds - yes the type you see guys wearing with tuxedos (I only just learned this but according to Wikipedia the word "cummerbund" originally comes from the Persian word "kamar" for waist and the Hindi "bandh" for band). The main focal points of this outfit is embroidery detail on the neckline and cuff. 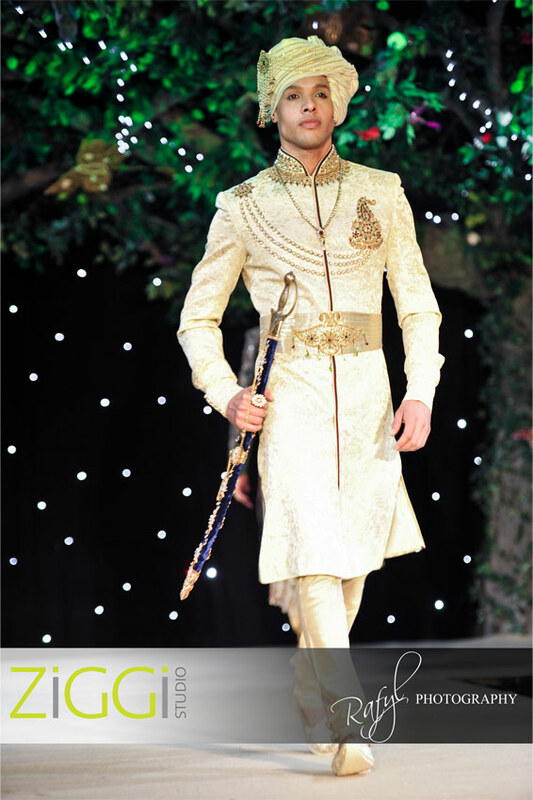 This outfit is one of my favourites out of the cream/gold coloured sherwanis from Ziggi Studio, funnily enough it's also the most expensive from this collection, featuring a self print brocade base fabric covered in crystal and pearl embroidery all over. This style of sherwani is something completely different to anything Ziggi Studio have done before and it's all about texture, from the ruched arms, to the velvet panels. 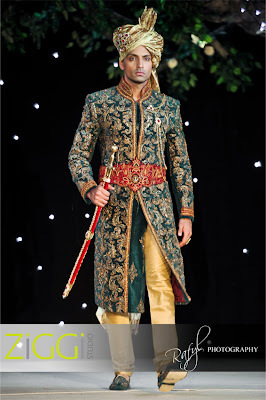 Personally, this was my least favourite from the collection, but I'd be interested to see what a real groom would look like wearing this amonst the rest of his wedding party. Another velvet piece, I love the "buttons" on this one above. 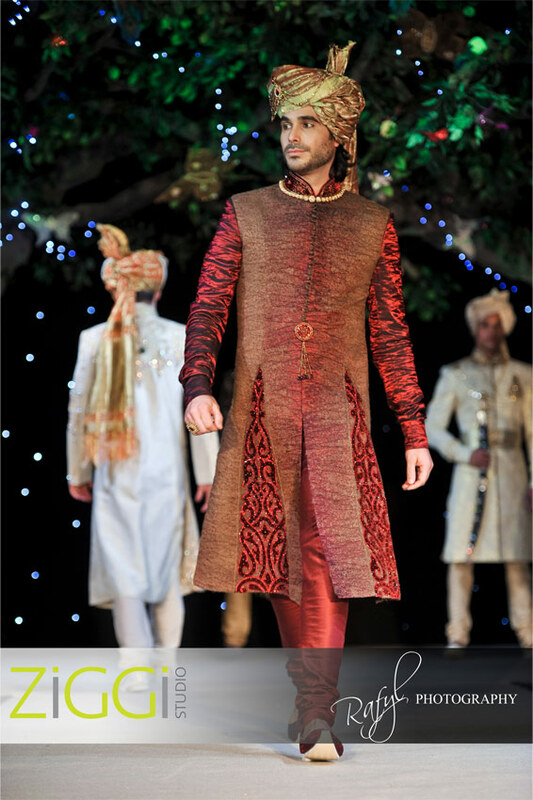 This final maroon/red sherwani looks quite heavy but according to Ziggi it's actually lightweight compared to the rest of the collection - a great option for a no-fuss groom who wants to look the part without having to commit to a heavy outfit! The finale of the Ziggi Studio fashion show at the Asiana Bridal Show was a surprise - a womenswear piece! Sadly for any female fans of Ziggi Studio they haven't decided to launch a womenswear collection, this piece was a one-off for the show. If you look closely, you can see she's wearing a shortened Ziggi Studio sherwani top - in the same design as his, but hers has been paired with a farshi gharara. I love both of these looks. A big thanks to Rafyl Photography for these photos and to Ziggi Studio for the additional info on each outfit. Ziggi Studio will be launching their website soon, but in the meantime join the Ziggi Studio facebook page for offers and updates. 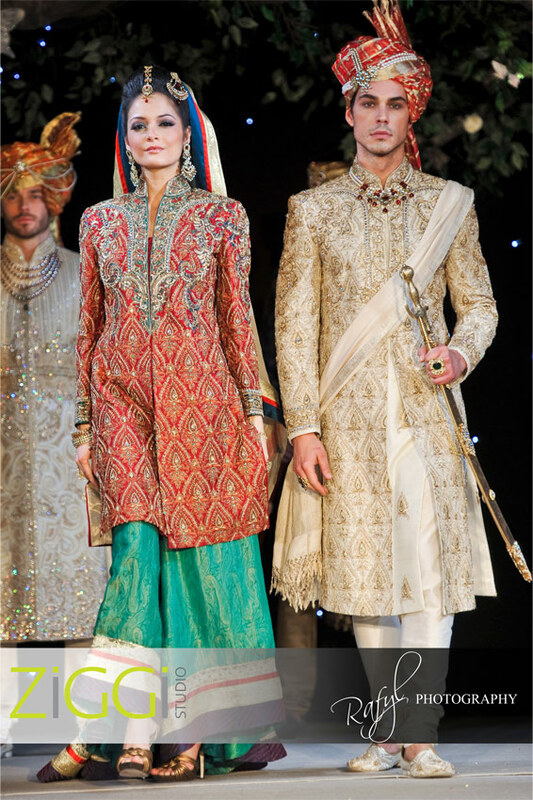 what a great collection, i had the privilage of getting myoutfit designed by ziggi and was amazed how different the sherwanis were. i'm not a traditionalist and after several weeks of wondering around the asian high street a freind recommended ziggi studio. i was very suprised that i found 6 outfits that appealed to me; a far cry from other boutiques were i couldnt find one that i likes. i didnt settle for the heavier pieces featured as they are to ragal for me but ziggi has a good balance of fusion outfits that i was comfortable wearing. thier servise is great and they know thier stuff really well. it would be great to see a real groom pulling off these looks, love that era..
love the new collection from Ziggi Studio, do they have a studio/showroom in london? They don't have a showroom in London, but I know that they do a lot of their photoshoots there, so it's worth giving Ziggi a call to see if you can arrange something. great blog, I love reading all the updates. Firstly The Asiana exhibition looks amazing, I can't believe I missed out. Some of the outfits just ooze elegance and quality. 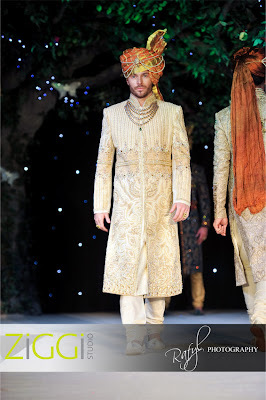 Ziggi's sherwanis are so different and unique any groom wearing them on their big day will really stand out in a good way. 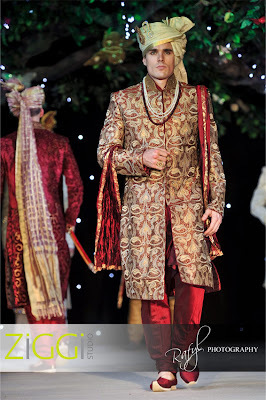 Im looking to get married this year so seeing some of the designers collection really helps. After reading the "first look" post i really like Guls style and Ekta Solankis work, and its the kinda stuff I'd be looking to buy. Cant wait to see the pics in the in depth blog. Finally awesome photographs, the ones that really stick out are Rafyls. Do you know if he does weddings? his website is down and there's very little information. Hope he doesn't charge a fortune, fingers crossed. 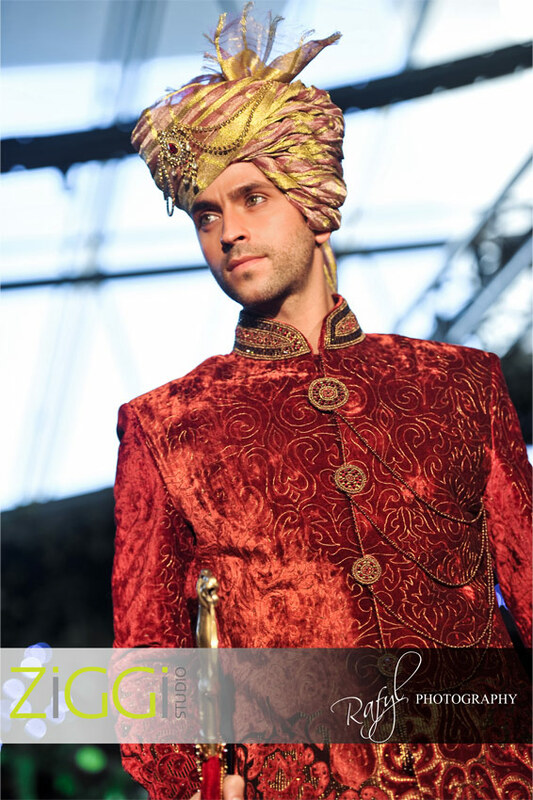 Love Ziggi's collection, looked great on the ramp. Also loved the Menswear Sonas Couture had on ramp, very elegant. Nice to see menswear with great style!! Ziggi Studios new collection is magic. Again it oozes in great sense of design and styling. Every pieces has its uniqueness. watching his collection on the catwalk is always very exciting. Great work ziggi studio. Nice blog. Wanted to find out will you be posting a video off Ziggi studio collection? my husband ordered his wedding outfit from Ziggi..amazing!! Hmm, i am not to sure about the whole mughal look, i mean its was good for a season or two, but i think the range of the styles at ziggi are seeming to stagnate in the same overall look without any progression from when he first launched his range a few years ago. He is a very talented designer and i hope he can keep up the interest by refreshing his range with each season.